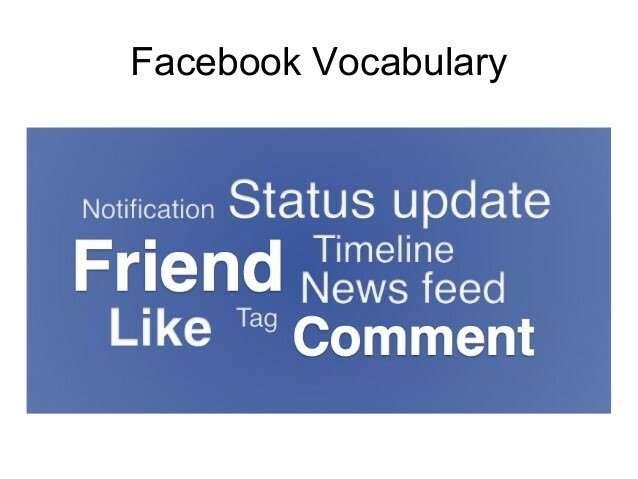 Are you familiar with the Facebook vocabulary? Social media is changing the way we communicate. It is making the language sound more trendy and simple. With social media taking over our life, the never-heard or used before terminologies are becoming common. In today’s world, whether a person needs to buy an LCD or undergo a professional training program, the decision is largely influenced by the trend in the social world, especially Facebook. We are addicted to this particular platform and there is no reason why one should not use it for personal progress. Did you know Facebook would be the third largest country, after China & India, had it been a country and not a social platform? Today, let us look at the popular words which are integral to the Facebook vocabulary. When we say Facebook lingo, what comes to your mind – like, status, poke, tag, etc. Since, Facebook is a global phenomenon, these words are now used globally in day-to-day conversations. ‘I got 100 likes to my blog post’. ‘Let me check my timeline’. ‘Wait, I forgot to check-in on Facebook’. So far, we had walls in our home and office but one wall which has become as famous as the Great Wall of China is the Facebook wall. What is a Facebook wall? It is place on your profile page where all your posts (posted over a period of time) are found. Likewise, when your wall becomes a long chain, timeline comes to your rescue. It helps you view all your posts based on time and date. In short, it is a calendar of all your posts over a period of time. Facebook lingo is spreading rapidly and is considered very easy to grasp. A person with less English speaking knowledge is also acquainted with the Facebook vocabularies. This is because Facebook is spreading like forestfire and everybody wants to be a part of it. Once you get addicted to the platform, there’s no looking back. Now, how many of you had heard the term ‘unfriend’ before using Facebook. We used to think that’s not even a word. There are a number of helpful pages on Facebook that let you improve your English vocabulary. One such page is https://www.facebook.com/eagespokenenglish. You can like this page to get tips on improving your spoken English every day. 2. Love idioms- let us learn a few!